^Offer applies to new and demonstrator QASHQAI ST, X-TRAIL ST 2WD, Navara ST & ST-X 4X4 Dual Cab models ordered between 1/4/2019 and 30/4/2019 and delivered by 31/5/2019. Auto upgrade not redeemable for cash. Premium paint available at additional cost. Private and ABN buyers only. Not available in conjunction with any other offer. Nissan reserves the right to vary, extend or withdraw this offer. 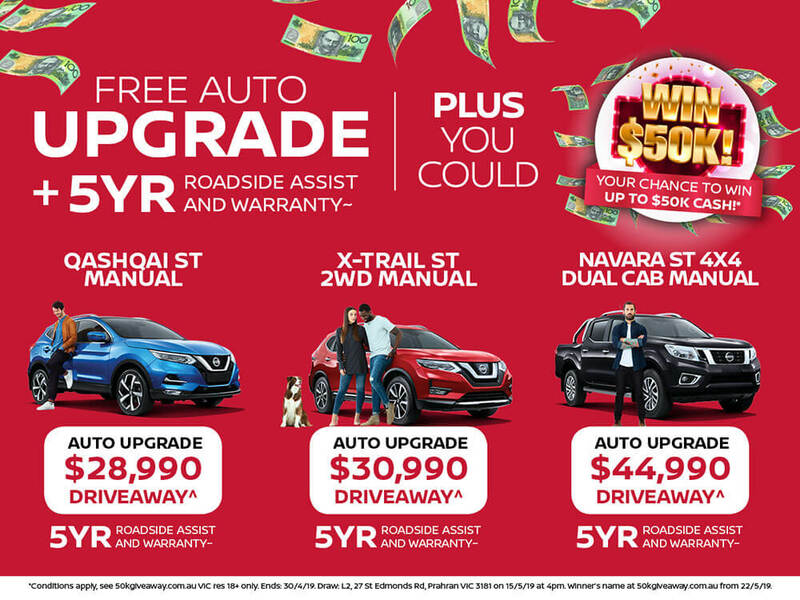 ~See full terms and conditions at https://www.nissan.com.au/owners/owner-information/warranty. *Conditions apply, see 50kgiveaway.com.au VIC res 18+ only. Ends: 30/4/19. Draw: L2, 27 St Edmonds Rd, Prahran VIC 3181 on 15/5/19 at 4pm. Winner’s name at 50kgiveaway.com.au from 22/5/19.